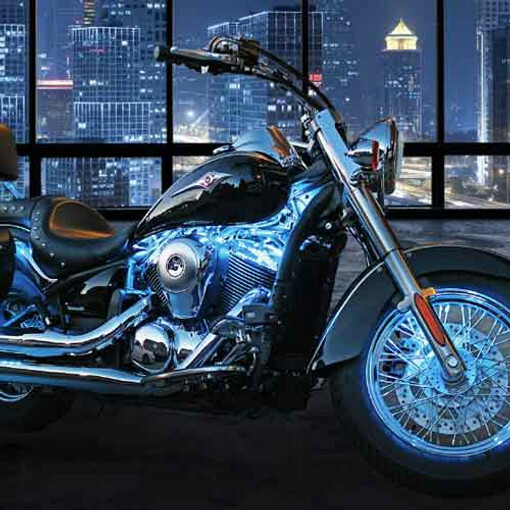 We offer several options for basic LED Engine Light Kits to fit almost any motorcycle and any budget. Our basic LED Engine Light Kits are the best in the business for lighting the engine areas of V-Twin Harley and metric bikes. Choose from our VALUE SERIES™ and PREMIUM SERIES kits in single color and multi-color variations. All of our basic engine kits will allow you to add on additional LED strips in the future should you decide you want to light other areas of your ride. All Boogey Lights® LED light kits are designed, assembled and supported in the USA!